It’ll be 21 days travelling by the time we get to San Diego. We will have covered close to 1,200 miles. After dusty dirty Turtle Bay, poor pathetic Penelope looks like she’s draggin’ across the finish line following the Boston Marathon. But, things always look gray when the sun doesn’t shine. We’ve had no sun for two days. On my watch last night, there were a billion stars in the sky and I thought I was going to wake to a sunny day. No, it was a trick. We are well equipped to navigate. 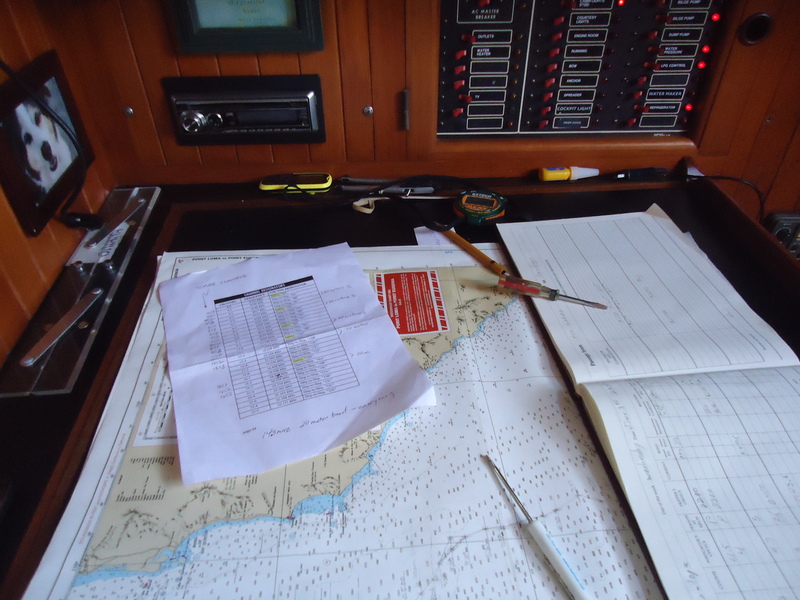 We constantly refer to the paper charts, Rose Point electronic navigational software and the Point Reyes, California Gridded Binary Data Files (GRIB), downloaded two times per day. As an engineer, I can easily make my way around latitude, longitude and the compass rose. We had intended to make our next landfall in Ensenada. Unfortunately, the most comfortable point of sail is due north (360 degrees Magnetic) rather than the north/northwest (300 degrees Magnetic) we need to arrive in Ensenada. Our course is taking us to San Quintin instead. The GRIB files indicate big wind at latitude 30 degrees 50 minutes north later today. Neither of us wants to ride on the back of Penelope as she bucks and gallops through 12 foot swell for 15 to 18 hours. We talked it over and agreed to pull in to San Quintin for the night. Peter revised our way point and set our new course. We’ll continue to Ensenada tomorrow when the winds are predicted to die down. It may sound mean but it’s true. My husband is a pig while I suffer from acute obsessive compulsive disorder (OCD). Throughout my life, when leaving for work in the morning, every morning, I turned back from the doorway to survey the rooms. I confirmed the bed was made, the dishes were neatly stacked in the dishwasher, curtains were pulled back and not a single dead leaf hung from a potted plant. Only then was it safe to leave for work. Now I live with a pig. We’ve known of this disparity for many years. Lately, it’s come to a head. When we lived in Bend, he had his own room. Several times a day I scoured the house for anything left out of place, carried it to his room, opened the door, flung stuff into the room and hastily closed the door. Now we live on a boat. For the past eight years I have spent between 10 and 30 minutes per day putting things in their proper place. A small price to pay for someone who can build or repair anything. For three weeks, Peter was in Portland. 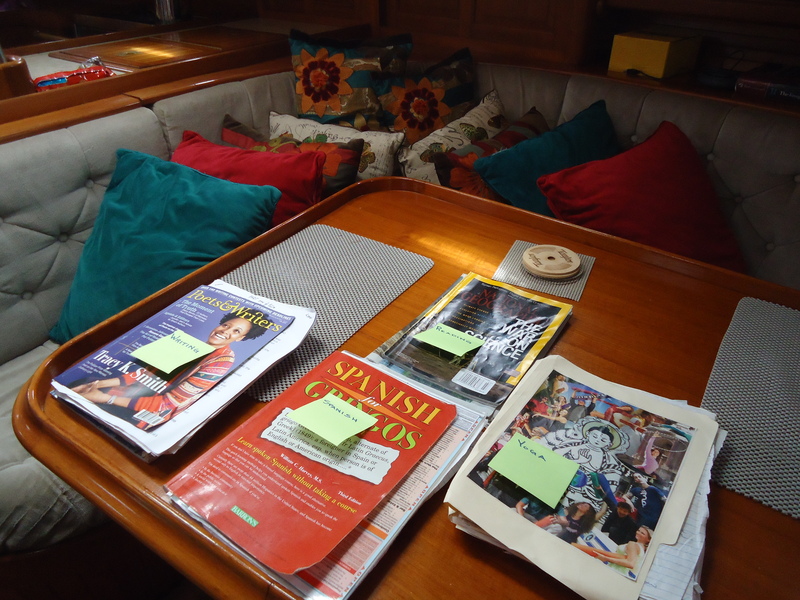 Every single thing on the boat was always put away where it belonged. For several weeks, I endured screw drivers on the kitchen counter, rolls of masking tape on the table, and all his clean laundry going almost directly from the drawer to a large pile on the spare bed. Imagine you are morbidly afraid of poisonous snakes. Every time you lay eyes on a poisonous snake, it sends a shock of fear and revulsion throughout your body. Once the electric stun subsides, you are left with a tremoring panic. Every time my gaze lands upon the clutter on the kitchen counter, navigation table, credenza or spare bed, all I see are angry, hissing, poisonous snakes poised to obliterate my serenity and send me hurling over the invisible precipice of sanity. Peter questioningly scratched his head, not knowing what I was talking about. A small price to pay for someone who loves me unconditionally.